SAN FRANCISCO -- California lawmakers announced Tuesday that they are making a new push to allow terminally ill patients to legally end their lives after opposition from religious groups and hesitance from fellow Democrats helped stall efforts earlier this year. The bill allowing doctors to prescribe life-ending drugs was renewed by legislators in a special session on health care convened by Gov. Jerry Brown. It comes after at least two dozen states have introduced aid-in-dying legislation this year, though none has passed a bill. Doctors already may give life-ending drugs in Oregon, Washington, Vermont and Montana. The right-to-die movement has been galvanized by the highly publicized case of 29-year-old Brittany Maynard, a California woman with brain cancer who moved to Oregon to legally take her life. She argued in widely viewed online videos that she should have been able to access life-ending drugs in her home state. "Californians should have more options available to those suffering constantly other than moving to other states or living in constant pain," Assemblyman Luis Alejo, D-Watsonville, said Tuesday at a press conference. Religious groups and advocates for people with disabilities opposed a nearly identical California bill this year, saying it goes against the will of God and put terminally ill patients at risk for coerced death. The measure passed the state Senate but stalled in the Assembly. Opponents said Tuesday that the new bill was a heavy-handed attempt to skirt the legislative process. The governor called the special session to address funding shortfalls for the state health insurance to the poor, Medi-Cal, and the home health aide program, but lawmakers are using it to advance other contentious legislation related to health care. "It is particularly troubling that in this rush to judgment, proponents are linking this bill with health care financing," said Tim Rosales, a spokesman for the Californians Against Assisted Suicide that includes groups advocating for Catholics, oncologists and people with disabilities. "That should be truly frightening to those on MediCal and subsidized health care, who quite logically fear a system where prescribing suicide pills could be elevated to a treatment option." Debbie Ziegler, Maynard's mother, criticized religious groups, including the Catholic Archdiocese of Los Angeles, that have been lobbying against the bill. "What right does anyone of a specific religious faith have to say I should act in accordance with their fate in my death?" she said. Advocates also have turned to courts, where they faced recent defeats in New Mexico and San Diego, where the judge said the issue should be resolved by state lawmakers. Elizabeth Wallner, a single mother with Stage 4 colon cancer who filed the San Diego lawsuit, urged lawmakers to allow people like her to have a peaceful death at home. "I don't want my son's last image to be of me struggling and in pain," she said. The earlier California bill stalled in the Assembly Health Committee. Sens. Lois Wolk of Davis and Bill Monning of Carmel could not get support from fellow Democrats on the panel who lost parents to cancer and who were uncomfortable with allowing patients to kill themselves. The new bill would bypass that committee. 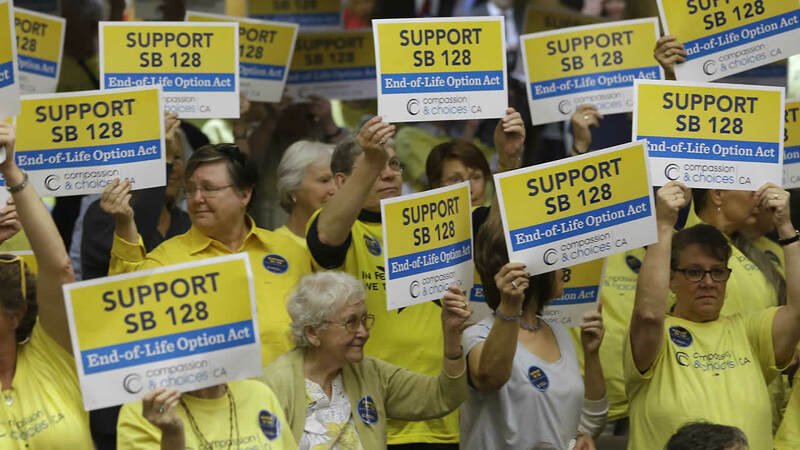 The right-to-die advocacy group Compassion and Choices has said it would attempt to qualify a 2016 ballot measure if they lose in the Legislature. For the latest details on Brittany Maynard's passing and right-to-die legislation, click here.